Docere, to teach, is at the very core of integrative practice. 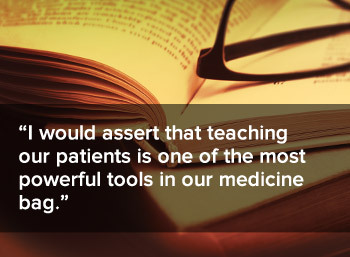 I would assert that teaching our patients is one of the most powerful tools in our medicine bag. Of course, most practitioners who practice integrative or natural healthcare do so, in part, because they believe in the importance of involving each patient in their own health recovery. And, teaching patients is requisite to their becoming empowered, informed and active participants in their own health. Many published studies suggest that educating patients about the nature of their diagnosis, triggers and symptoms, and the rationale for the suggested plan of care improve patient adherence. However, evidence for the role of education in determining patient outcomes is mixed. Could this, in some measure, be due to the nature of the education being provided? If so, what makes for effective teaching in the context of patient care? There are certain qualities shared by the best teachers. Foremost amongst these is passion. People who are excited about what they are teaching inspire interest on the part of the learner. I remember my high school social studies teacher. He would get so excited about what he was teaching that as the lessons progressed, his voice went up an octave and he would actually bounce on his toes. His enthusiasm was infectious and actually influenced my choice of majoring in anthropology in college. Practitioners, too, are the best teachers when they are excited about what they are explaining, enamored of the underlying biochemistry or simply thrilled by the results that they have witnessed. Conveying this enthusiasm ignites motivation and trust on the part of the patient. However, practitioners teetering on the brink of burn out, or exhausted by their responsibilities will find it nearly impossible to summon up this passion. Their ability to teach will suffer and with it, their patients and their practices. Assuming that one’s passion is secured into the framework of practice, an attitude of being a student as much as a teacher is imperative. When we recognize that we don’t know everything and that each patient has much to teach us, we create an atmosphere of exploration and discovery. This facilitates partnership with patients. Patients who are supported within this sense of partnership will have more confidence to make changes, try new things and invest in their health. Finally, it is important for practitioners to be smart about what they are teaching. When people place their health into our hands, we are obligated to apply our best thinking to the tasks before us. The only way we can be successful at providing good healthcare and inspiring our patients to adhere to our recommendations towards living healthier lives is when we are offering good therapies. Thus, we must continually seek out new knowledge and understanding. I remember Dr. John Bastyr, the namesake of Bastyr University, explaining that he took it upon himself to read at least one article every night before sleep. He further explained that his practice extended to include these nightly reading sessions as a critical component of his ability to care for his patients. Summing it all up, I suggest that to best fulfill our chosen roles as integrative healthcare practitioners, we each inspire our patients to greater wellness through passionate, humble and informed teaching.